The term "Amphora Winery" or "us" or "we" refers to the owner of the website. The term "you" refers to the user or viewer of our website. You must be 21 years of age or older, to order or receive alcoholic beverages from Amphora Winery. By state law, receipt of shipments containing alcoholic beverages requires the signature of a sober adult (a person 21 years of age or older who is not intoxicated). Because of the signature requirement, we prefer to ship to a business address. Wines purchased from Amphora Winery are not for resale, and are for personal consumption only. Due to the ever-changing nature of wine shipping laws, we may be able to ship wines, directly or indirectly, to most states. If Amphora Winery is unable to ship directly to your state, we may arrange for the sale and shipment of our products through a third party. Please note, when dealing through a third party, wine prices, discounts, and shipping costs may differ from those displaying on this website. If you have a question about direct shipping, please call us! 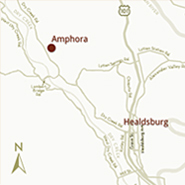 Federal Express Ground is Amphora Winery’s carrier of choice, while we also employ Golden State Overnight for California deliveries, and UPS shipping is often available by special request. By state law, receipt of shipments containing alcoholic beverages require the signature of a sober adult (a person 21 years of age or older who is not intoxicated). Because of the signature requirement, we prefer to ship to a business address. Please note that shipments which are returned to Amphora Winery as undeliverable will incur a $15 per package return charge AND additional shipping charges. Wine is a perishable commodity. Wine does not like extremes of temperature: hot summer and cold winter weather may adversely affect the condition of your wine during shipment. While we do our best to avoid shipping during inclement weather, Amphora Winery is not responsible for, and will not replace wine that is damaged by extreme weather conditions during shipment. When your wine order is picked up by the common carrier for delivery, responsibility for the wine becomes the responsibility of the purchaser.